Rhundunan is situated in the small settlement of Colbost – which has been put on the map by being the home of The Three Chimneys, voted as being one of the top 5 restaurants in the world. 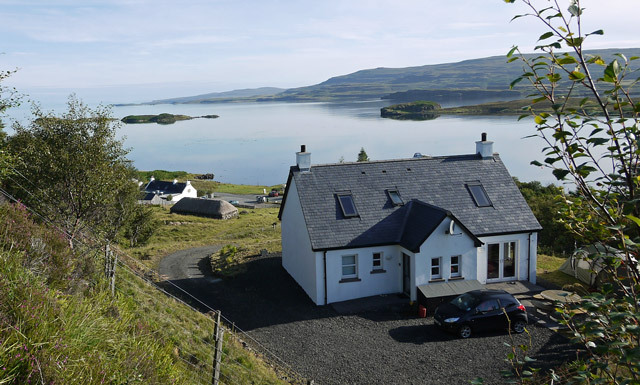 Whilst the food is delicious at the Three Chimneys, people from all over the world – including celebrities – mainly visit the restaurant because of its awe-inspiring views over Loch Dunvegan, the Cuillin Hills and over to the Outer Hebrides. So just imagine the delight of our guests at Rhundunan who arrive to realise that the views from this stylish house (built by the previous owners of the Three Chimneys) are even more amazing, nestling as it does on the hillside just above its celebrated neighbour, which is just 200 metres from the front door. Colbost itself is a crofting settlement, in the north west of the island, which runs along the side of Loch Dunvegan. Rhundunan offers a traditional exterior design which blends with the crofting architecture of the area, whilst the interior offers a modern contemporary finish. It’s a rarity to find such a stylish holiday home in such a rugged landscape. The living room features a dramatic double height vaulted ceiling with balcony area and large cathedral style windows with views to die for. With a reclining sofa from which to curl up in front of the fire or the large screen TV, you can enjoy cosy nights in after a day of exertions. The lounge opens on to a well equipped kitchen, with granite worktops, big oak dining table and all mod cons. There’s also a king-size master bedroom complete with an en-suite shower room, two additional bedrooms, family bathroom and a kitchen and utility room. 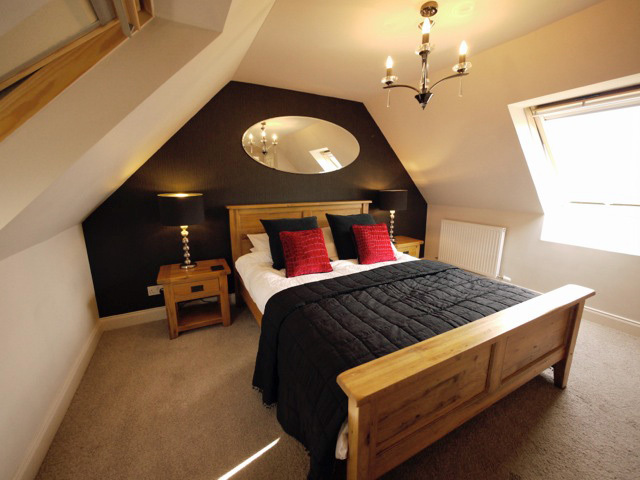 The property has been well equipped and furnished to a high standard. 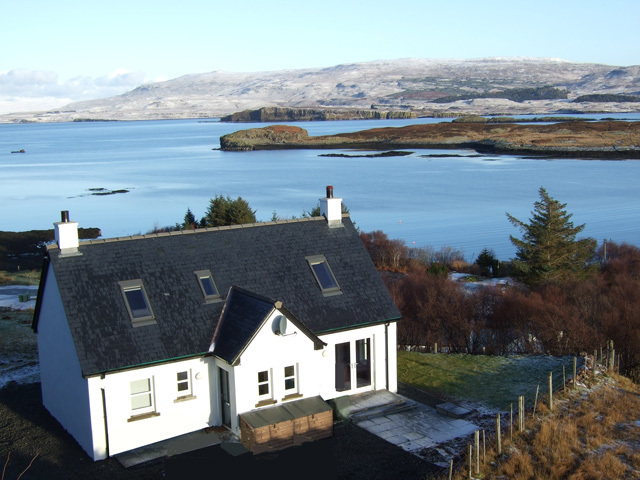 Rhundunan, from its elevated position, commands panoramic views out across Loch Dunvegan to the Outer Hebrides in the North. However, it does not end there, its unique position on the island also offers uninterrupted views of the Cuillin mountains in the south, as well as the flat top peaks of Healabhal Mhor (1538ft) and Healabhal Bheag (1600ft), better known as MacLeod's Tables, called after the legendary clan chief who apparently held an open air feast on the lower of the two for James V.
Also on the doorstep is the Colbost Croft Museum. The museum, a restored blackhouse, shows how the islanders would have lived in the 1800s. The museum has a restored illegal still, where islanders would brew their own “water of life”. Nowadays the island has its own distillery at Talisker producing one of the most well known of Scottish whiskies. The single malt being produced here is consistently regarded by experts as one of the very best single malts available; it is characterized by a powerful and peppery taste and has been referred to as “the lava of the Cuillins”. The visitor centre and tour here are well worth a visit. The area lying to the west of Dunvegan is referred to as the Duirinish peninsula. Most of this area is wild and uninhabited so is an ideal spot for wildlife enthusiasts and hill walkers of all levels, and a haven for bird watchers. The sea-loch coastline offers opportunities to see golden eagles, sea eagles, basking sharks and whales. One of the best walks on the coastline is nearby Neist Point complete with its lighthouse and caves. The views from here are spectacular and, on a clear day, the islands of the Outer Hebrides are clearly visible. Dunvegan castle and gardens are just a few miles away where you can also take a boat trip and visit the seal islands. The wonderful coral beaches just north of Dunvegan are also well worth a walk. The main population towns on the island are Broadford and Portree, both of these have a good range of cafes, restaurants and shops selling locally made clothing, crafts and jewellery, together with larger supermarkets for all your holiday needs. Portree is also home to the Aros Centre with its cinema and restaurant. The village of Dunvegan – just 2.5 miles away - also has an excellent bakery, cafes and restaurant – in particular, The Old School Restaurant is definitely worth a visit. Rhundunan – situated in such a stunning environment and with its two double bedrooms and a bunk room – has everything you need for a family holiday, a friends get-together or maybe just a romantic get-away-from-it-all trip for two. Kitchen, gas hob, electric oven, microwave, dishwasher, fridge, freezer, washing machine and tumble dryer, plus all the usual cooking utensils, dining table and chairs for six. 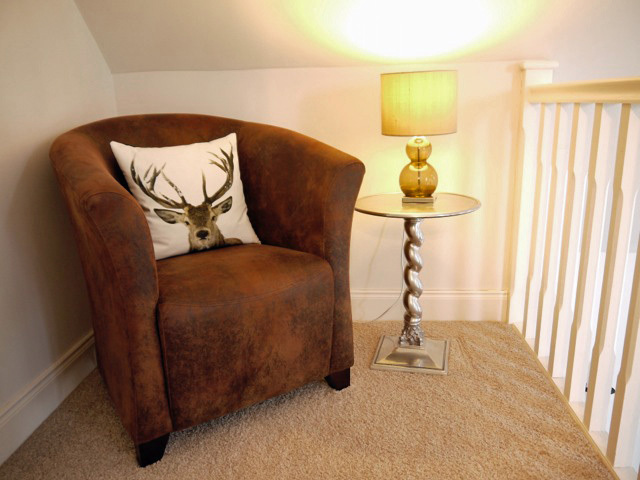 Spacious lounge with double height vaulted ceiling, comfortable seating, gas fire. Digital flat screen Freeview TV, DVD player, surround sound music system and iPod dock. Access to upstairs bedroom area. Bathroom with shower over, heated towel rail, shaving point, wc, whb. Reading area overlooking downstairs lounge. 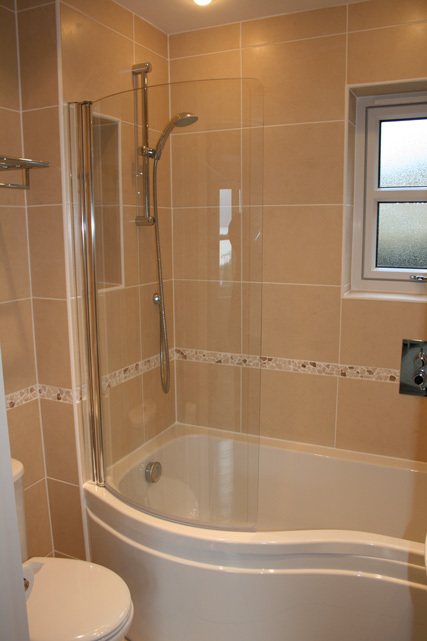 En-suite shower room, heated towel rail, wc, whb. A very well equipped and comfortable cottage with beautiful views in a peaceful location. I would love to return! Lovely break in a fantastic property, has everything you might need for a 'get away from it all' holiday. Our second visit and well worth it. Our stay at Rhundunan was very comfortable and it was one of the best houses that we have rented. As a couple we had the house to ourselves and it is well equipped with everything that you need. The utility room came in very handy when we got drenched in a lovely rain storm while on a trip to Coral Beach but that is the beauty of Skye. Great views to keep you mesmerised all day long if you decide to stay in. Will be recommending to all my family and friends and would love to visit again in the future. Excellent property that is well equipped. Very highly recommended. Wonderful stay, great value for money and we had a lovely time. The house is very well equipped with a full kitchen, and has stunning views. Added bonus of The Three Chimneys restaurant being at the bottom of the driveway. Would definitely recommend staying here. One word: Superb. Excellent in every way. we have just returned from a week's stay at Rhundunan Colbost Skye. The property was amazing - even better than in the photos and Skye was fantastic. It was one of those rare places where we were genuinely sad to have to leave. 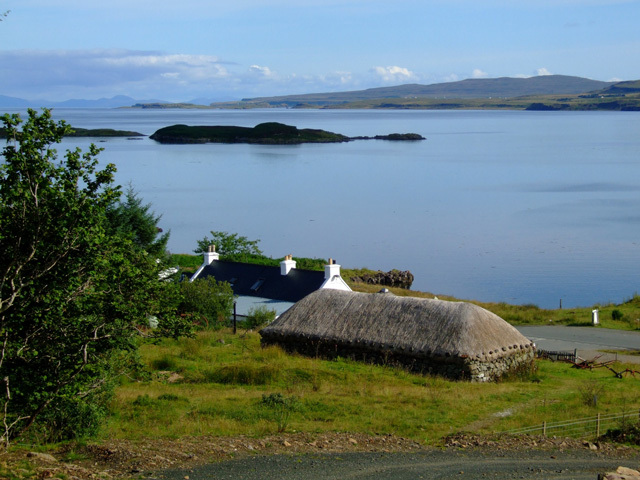 We would recommend Skye and Rhundunan and hope to return to both. 28th May 2011 Had a lovely week at Rhundunan (despite the weather) the cottage was excellent, well equipped and the views were spectacular. Would definately recommend this cottage. We had a fantastic and sunny week (4-11 sept. 2010) at Rhundunhan. The house was clean and well equiped. We will return . Excellent, met our expectations. Very clean, confortable, spacious and well equipped cottage. Would return.